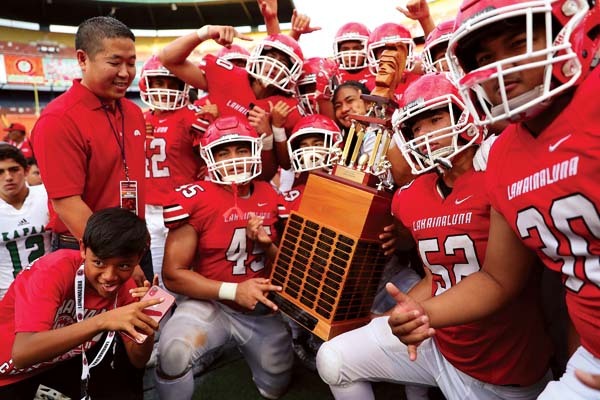 HONOLULU — This wasn’t a seven-overtime marathon like last year, but it certainly earned a spot on the Lahainaluna High School Mount Rushmore for football games. 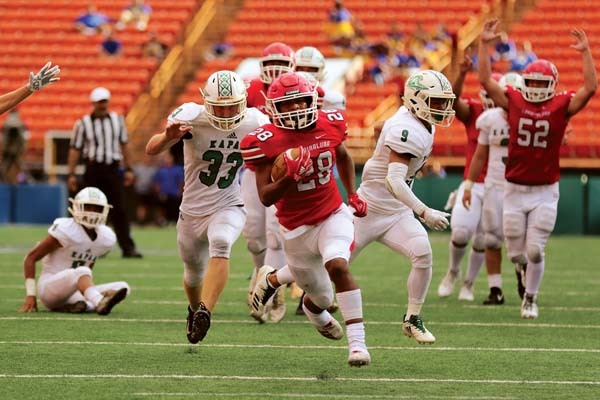 The Lunas blasted back from a 19-point halftime deficit to claw past a determined Kapaa team 34-32 in the First Hawaiian Bank/HHSAA Division II state championship game on Saturday afternoon at Aloha Stadium. 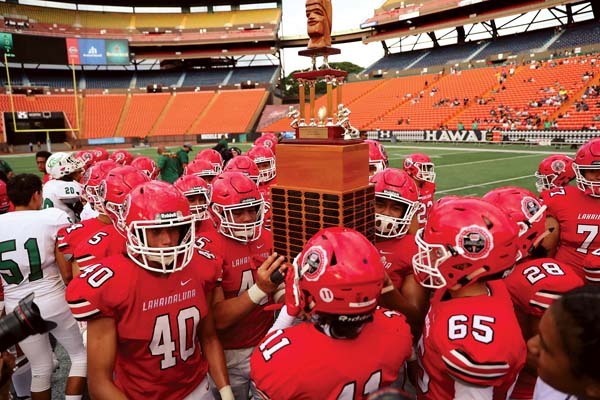 With its 21st straight victory overall, Lahainaluna (11-0) became just the second team in Hawaii history to win three state football titles in a row, joining Iolani (2007-12). The Lunas were certainly tested early in the second half when they were already trailing 26-7. On the Lunas’ first possession of the second half, Nainoa Irish’s pass was intercepted and returned 23 yards by Kaiola Lingaton. 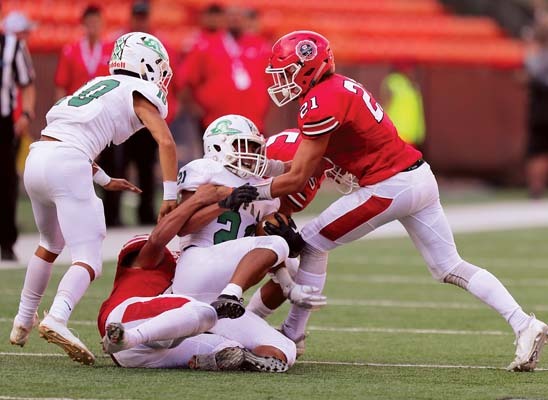 The Warriors were set at the Lunas’ 7-yard to perhaps deliver a knockout blow, but Ryno Banasihan fumbled on second down and the ball was recovered by Lahainaluna’s Kaihulali Casco at the 1. 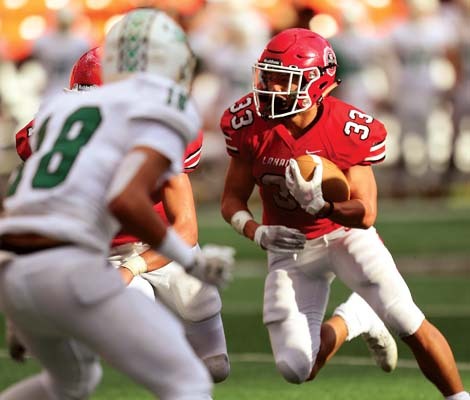 The Lunas responded with a 13-play, 99-yard drive that was capped by Joshua Tihada’s 1-yard touchdown run with 3:46 to go in the third quarter. The rushing score was the 12th of Tihada’s state tournament career, tying the all-division record held by Saint Louis’ BJ Batts, who set it from 2001-03. The drive was helped by four penalties on Kapaa (7-3) for a total of 25 yards. Tihada broke the record moments later, on a 2-yard plunge on the first play of the fourth quarter to pull the Lunas within 26-21 with 11:55 to play. Tihada’s 51-yard run gave the Lunas’ first-and-goal from the 8. The next time the Lunas had the ball, they took the lead back on Tihada’s 4-yard run with 7:02 to go. The scoring play capped a nine-play, 65-yard drive that covered 2:47. Irish was stellar on the drive, starting it with a 5-yard pass to Kai Bookland then adding a 17-yard run. After a 16-yard run by Kamalei Watson and an incomplete pass, Irish ran for 11 and a first down to the 16. Then Irish ran for 6 yards on each of back-to-back escapes from the backfield as he was under major pressure from the Kapaa pass rush. Joshua Tihada scored two plays later. The Lunas’ defense came up big on the next possession when Watson intercepted Kahanu Davis and returned it 33 yards. A 15-yard penalty forced the Lunas to start at the Warriors’ 43, but Derek Perez scored on a 23-yard run, going untouched up the middle to put the Lunas ahead 34-26 with 4:05 to go. 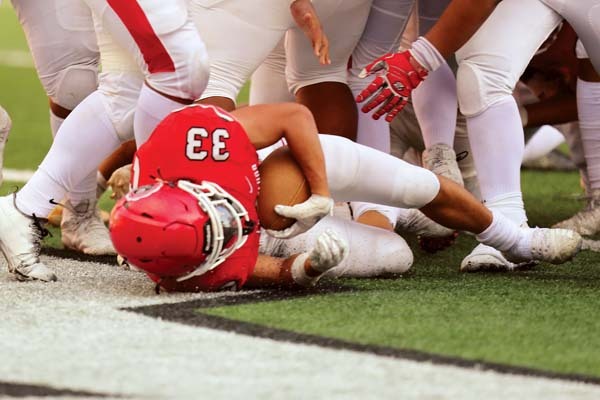 The game was not over, however, as the Warriors responded with a six-play, 56-yard drive, climbing within 34-32 on Tyson Tranilla’s 1-yard TD catch from Davis with 2:17 left. Davis’ pass on the two-point conversion attempt sailed out of the end zone. With both teams without a timeout remaining, Joshua Tihada ran for 3, 4 and 3 yards on the ensuing possession for the game-ending first down. 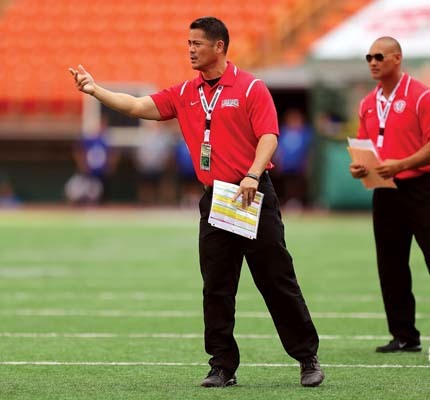 Tihada saw a slight nod from his father, Joey Tihada, a veteran Lahainaluna assistant coach. The junior running back knew exactly what his dad was talking about without any verbal communication. The Lunas took the opening kickoff 80 yards in 10 plays and jumped on top 7-0 on a pretty 28-yard pass from Irish to Tihada with 7:52 left in the first quarter. Then, they fell behind for just the second time all season and the second time against Kapaa, who they beat 30-10 in a preseason game in early August. The Warriors scored touchdowns on each of their first three drives then added long field goals by Chysen Lagunes-Rapozo on their next two to go into the locker room up 26-7. Kapaa needed just five plays to tie the score at 7-7 when Lanakila Pagtolingan caught a 3-yard scoring pass from Davis. The big play on the drive was a 53-yard run by Banasihan to the Lunas’ 6-yard line. 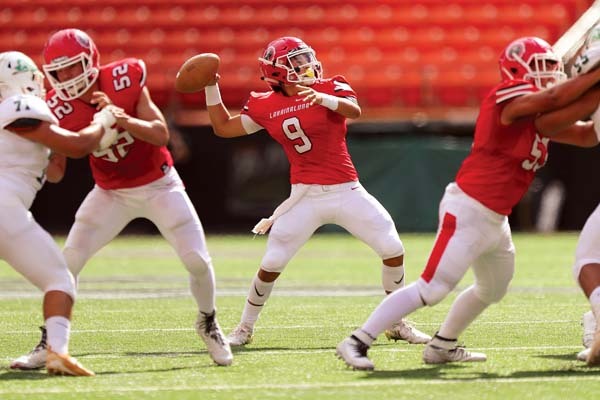 After Lahainaluna turned the ball over on downs, the Warriors went 72 yards in four plays, taking a 13-7 lead on a 53-yard strike from Davis to Jai Alapai. A 29-yard punt gave the ball to Kapaa on its own 41 and the Warriors methodically marched 59 yards in eight plays, scoring again on Davis’ 5-yard run. A bad snap cost the Lunas 18 yards and then a 15-yard punt gave the ball back to the Warriors on the Lahainaluna 36. After losing two yards in a three-and-out possession, Lagunes-Rapozo nailed a 55-yard field goal to make it 23-7 with 2:48 to go in the second quarter. That kick broke the all-division state tournament field goal distance record of 53 yards by Punahou’s Jet Toner set against Mililani in the 2014 Division I championship game. After Alapai intercepted a pass by Esekielu Storer and a 46-yard run by Banasihan, Lagunes-Rapozo drilled a 45-yarder on the final play of the half to push the margin to 19. LL–Joshua Tihada 28 pass from Nainoa Irish (Kaihulali Casco kick), 7:52. K–Lanakila Pagtolingan 3 pass from Kahanu Davis (Chysen Lagunes-Rapozo kick), 5:59. K–Jai Alapai 52 pass from Davis (kick blocked), 0:59. K–Davis 5 run (Lagunes-Rapozo kick), 6:55. LL–Tihada 1 run (Casco kick), 3:46. LL–Tihada 2 run (Casco kick), 11:55. LL–Tihada 4 run (run failed), 7:02. LL–Derek Perez 23 run (Casco kick), 4:05. K–Tyson Tranilla 1 pass from Davis (pass failed), 2:17. RUSHING–Kapaa, Ryno Banasihan 25-197, Davis 6-48, Kawika Nao 6-13; Lahainaluna, Tihada 27-152, Irish 11-71, Perez 3-38, Kamalei Watson 3-25, Etuati Storer 4-10, Jesse Dudoit 1-8, team 2-(minus 23). 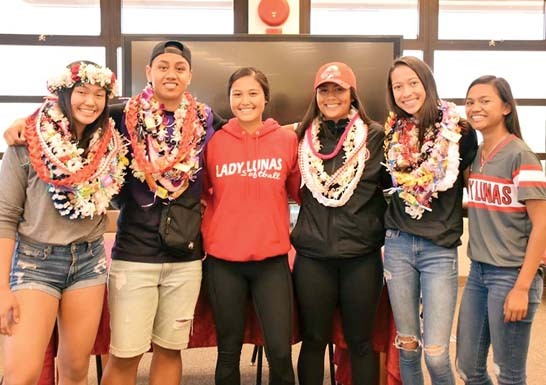 PASSING–Kapaa, Davis 5-8-0–83, Pagtolingan 0-1-1–0; Lahainaluna, Irish 10-15-1–132, Esekielu Storer 1-2-1–6, Tihada 1-1-0–11. 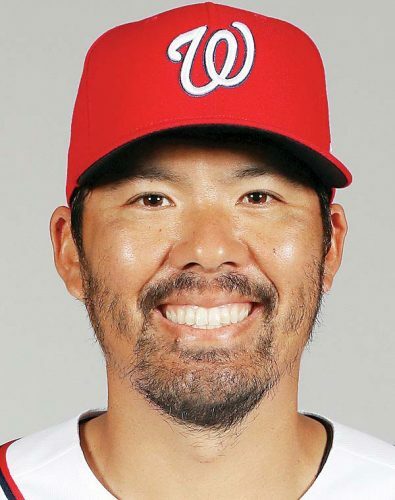 RECEIVING–Kapaa, Pagtolingan 2-30, Alapai 1-52, Tranilla 1-1, Banasihan 1-0; Lahainaluna, Casco 3-34, Kawehi Gillcoat 3-30, Kai Bookland 3-19, Tihada 1-28, Brian Sandoval 1-27, Dudoit 1-11.